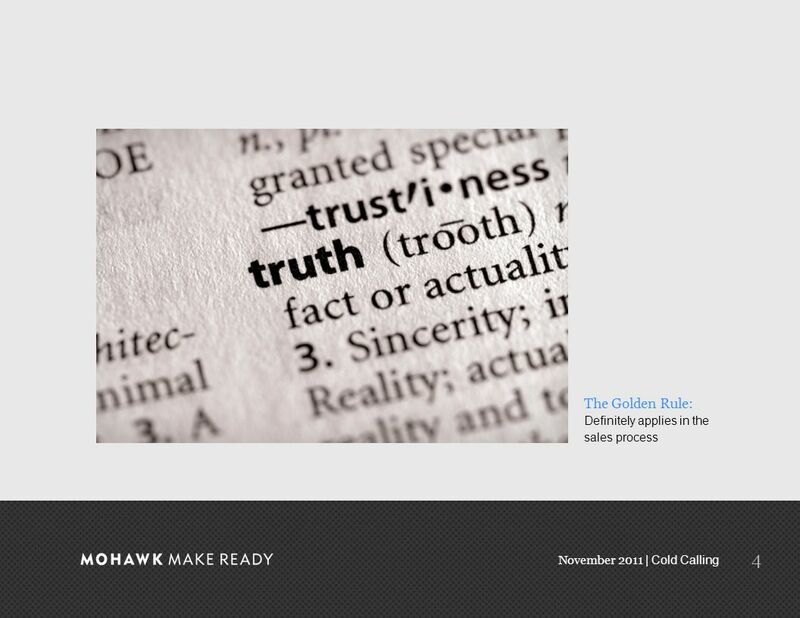 November 2011 | Cold Calling Prospecting Without Fear November 2011 0. 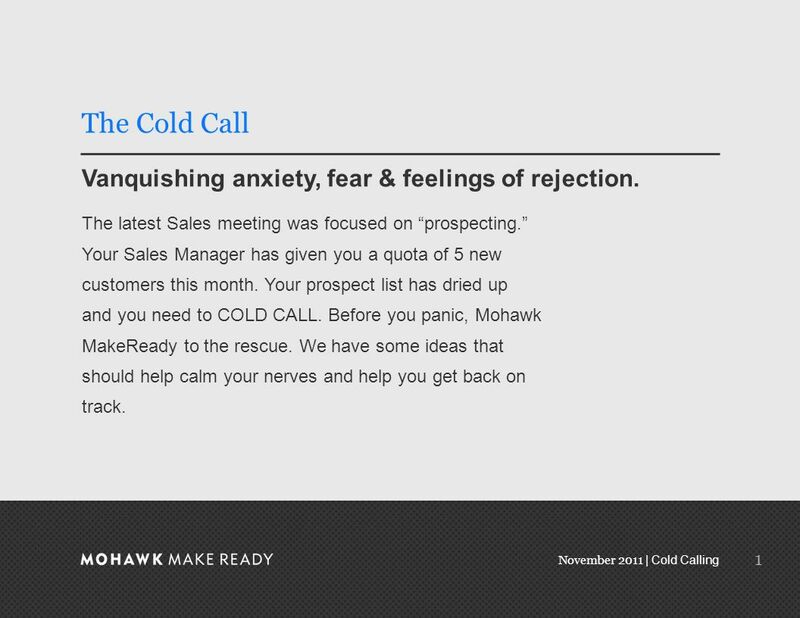 2 November 2011 | Cold Calling 1 Vanquishing anxiety, fear & feelings of rejection. 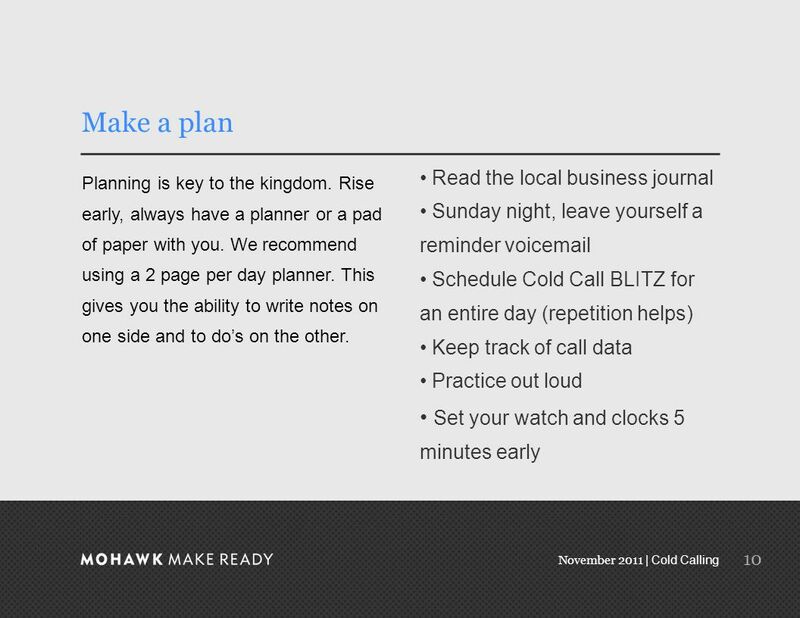 The Cold Call The latest Sales meeting was focused on prospecting. Your Sales Manager has given you a quota of 5 new customers this month. Your prospect list has dried up and you need to COLD CALL. 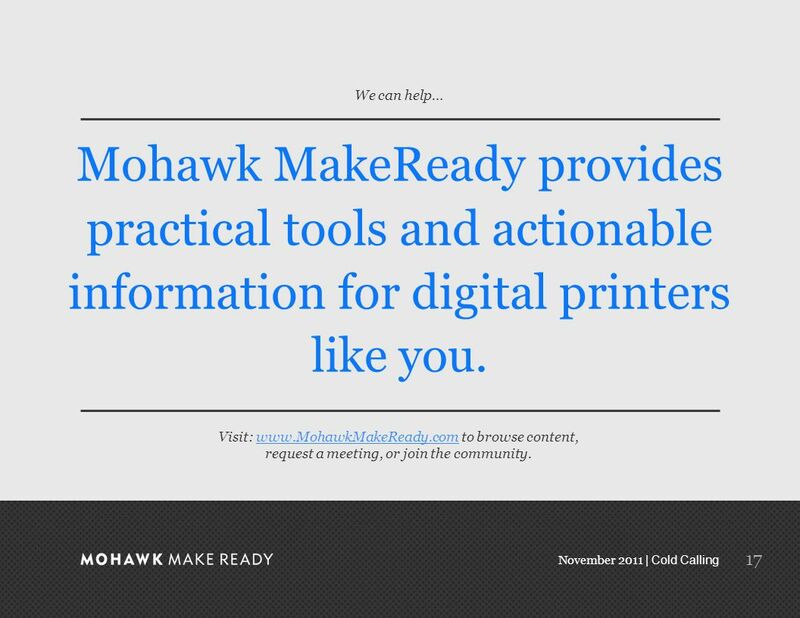 Before you panic, Mohawk MakeReady to the rescue. We have some ideas that should help calm your nerves and help you get back on track. 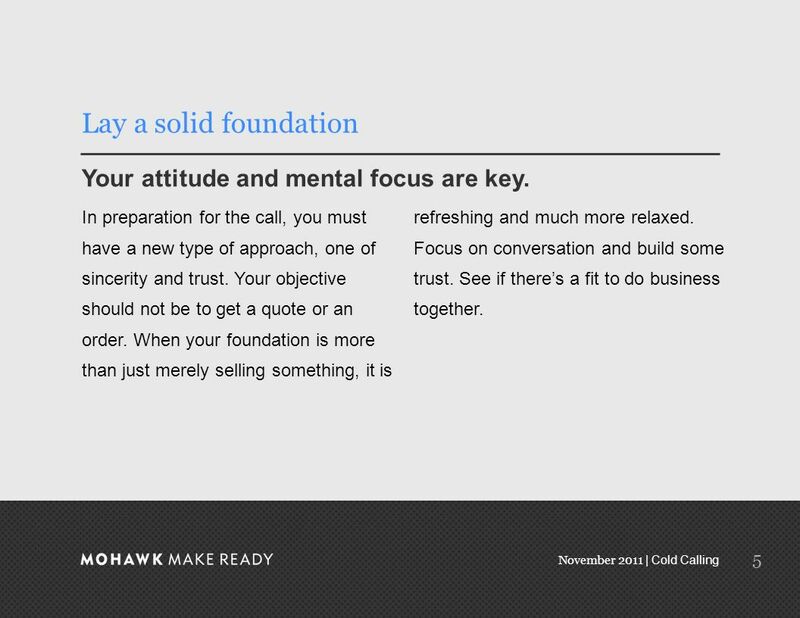 4 November 2011 | Cold Calling 3 Dont take any part of the call personally. 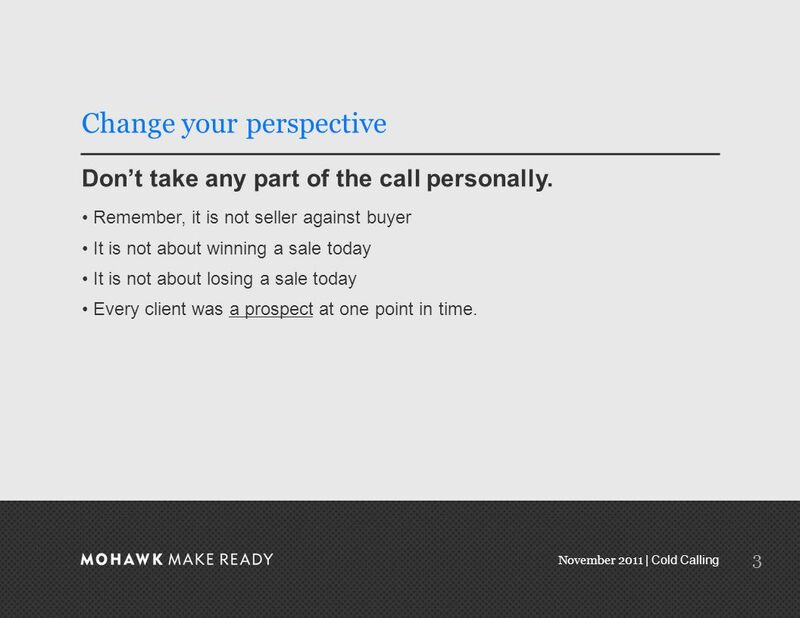 Change your perspective Remember, it is not seller against buyer It is not about winning a sale today It is not about losing a sale today Every client was a prospect at one point in time. 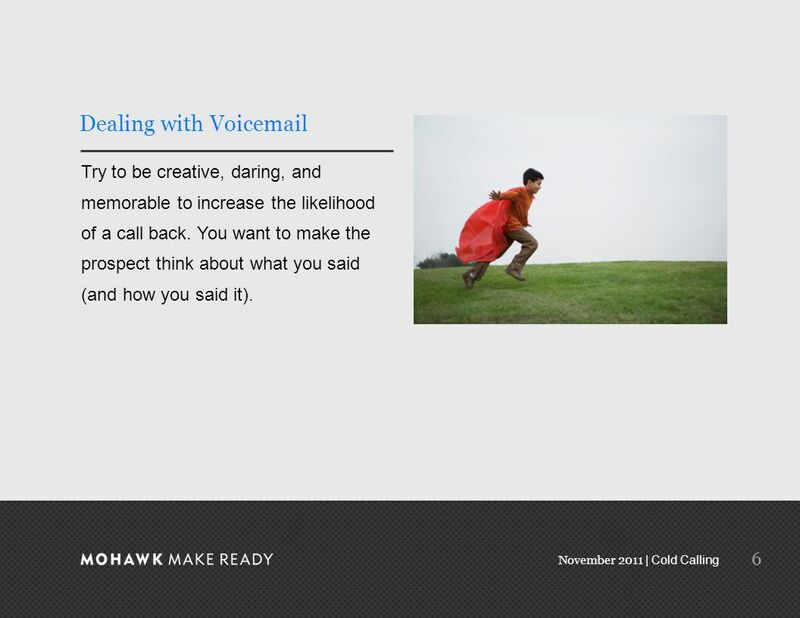 7 November 2011 | Cold Calling 6 Dealing with Voicemail Try to be creative, daring, and memorable to increase the likelihood of a call back. 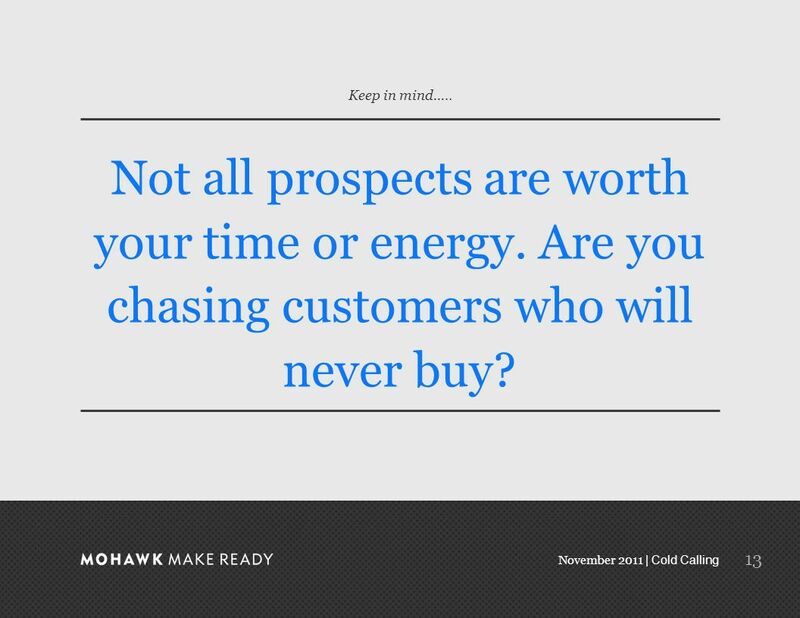 You want to make the prospect think about what you said (and how you said it). 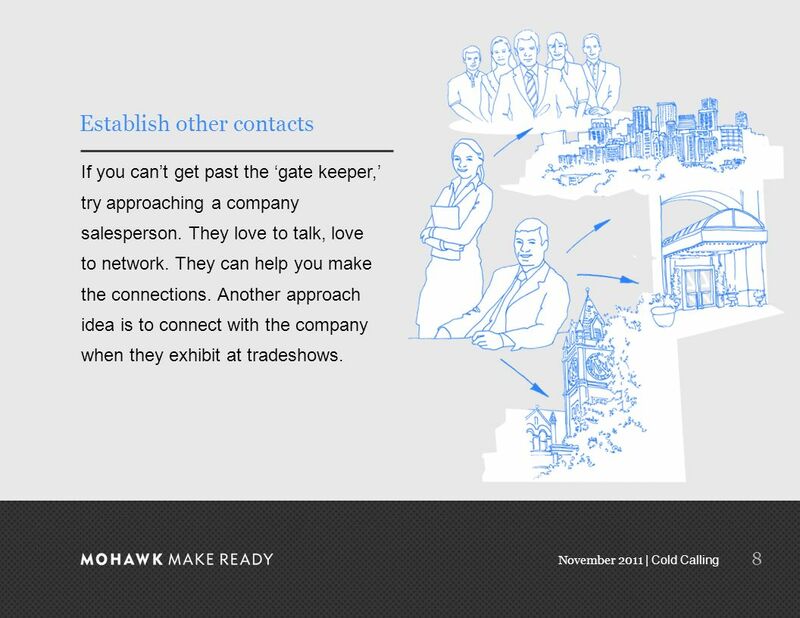 9 November 2011 | Cold Calling 8 Establish other contacts If you cant get past the gate keeper, try approaching a company salesperson. They love to talk, love to network. They can help you make the connections. Another approach idea is to connect with the company when they exhibit at tradeshows. 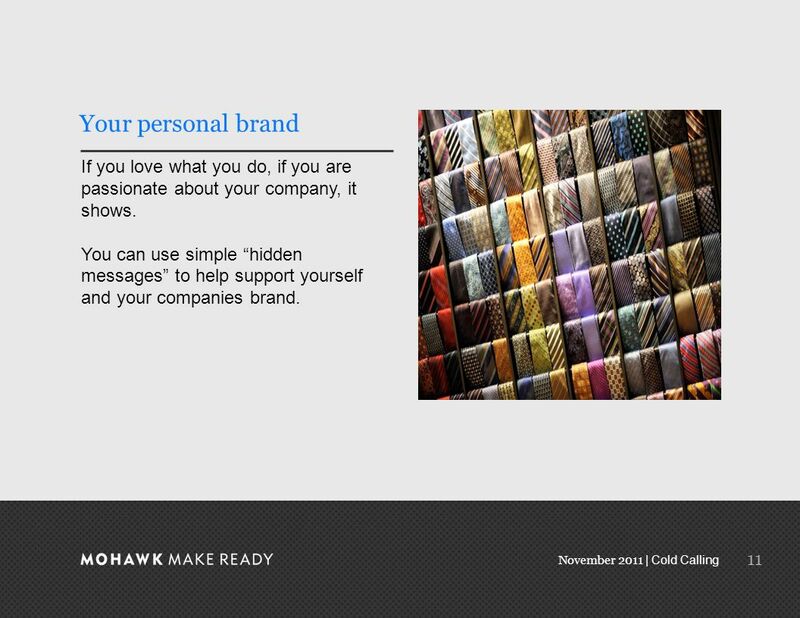 12 November 2011 | Cold Calling 11 Your personal brand If you love what you do, if you are passionate about your company, it shows. You can use simple hidden messages to help support yourself and your companies brand. 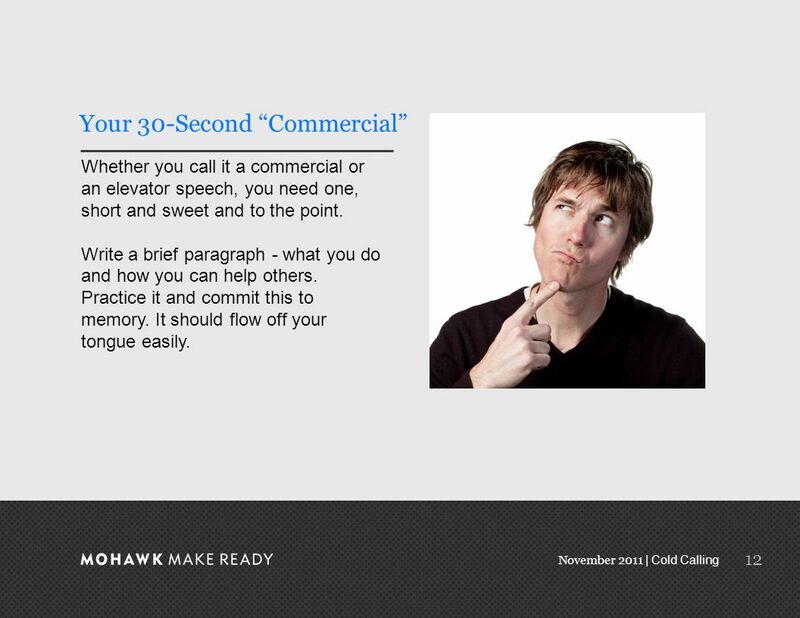 13 November 2011 | Cold Calling 12 Your 30-Second Commercial Whether you call it a commercial or an elevator speech, you need one, short and sweet and to the point. Write a brief paragraph - what you do and how you can help others. Practice it and commit this to memory. It should flow off your tongue easily. 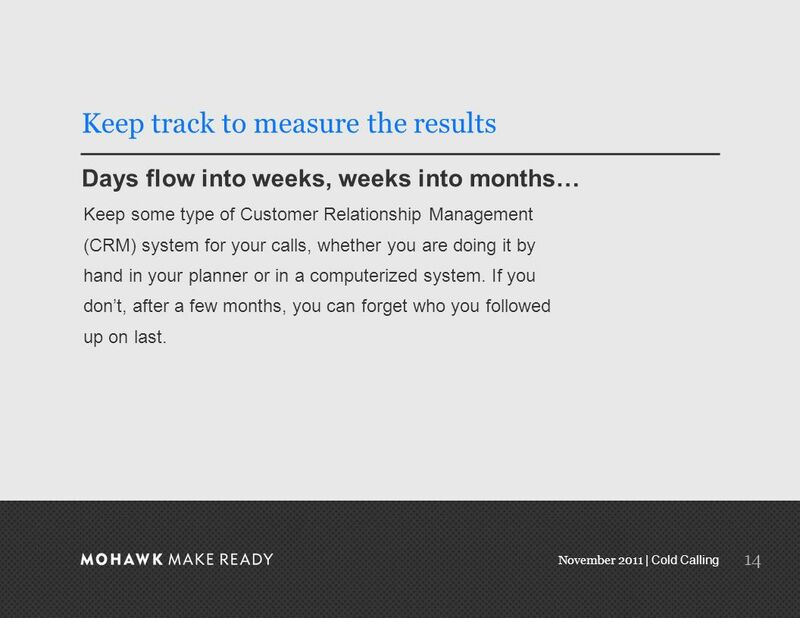 15 November 2011 | Cold Calling 14 Days flow into weeks, weeks into months… Keep track to measure the results Keep some type of Customer Relationship Management (CRM) system for your calls, whether you are doing it by hand in your planner or in a computerized system. If you dont, after a few months, you can forget who you followed up on last. 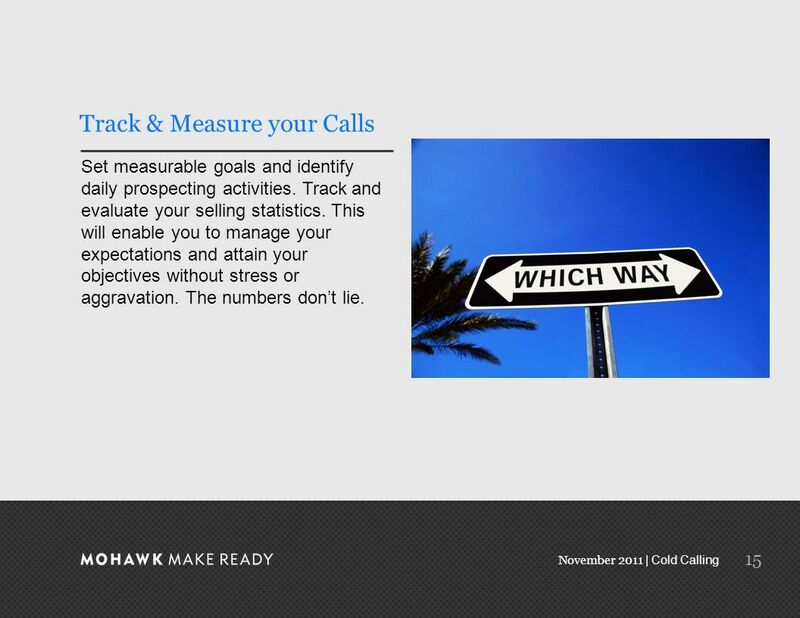 16 November 2011 | Cold Calling 15 Track & Measure your Calls Set measurable goals and identify daily prospecting activities. Track and evaluate your selling statistics. This will enable you to manage your expectations and attain your objectives without stress or aggravation. The numbers dont lie. 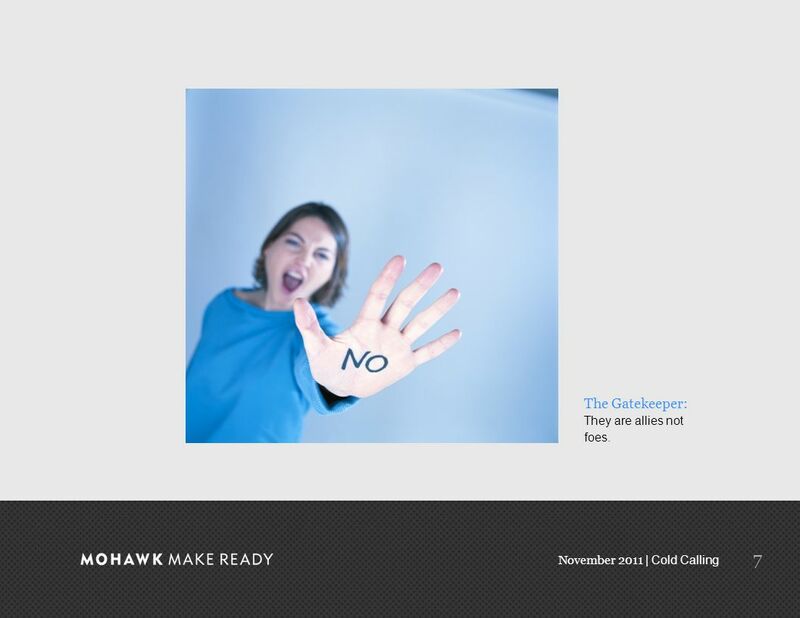 Download ppt "November 2011 | Cold Calling Prospecting Without Fear November 2011 0." Starting a Club 1. 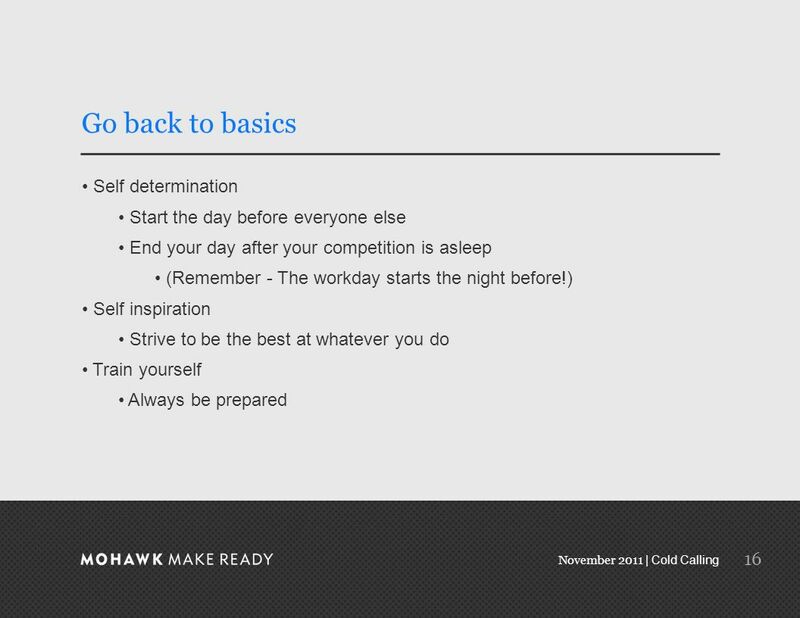 How to Get Started Set a realistic start date Determine how many people/months –Advantages of more people in a club Average customer. © Creative Development 2009 in partnership with Business Link in London Marketing and PR for Social Enterprises. Good Karma This is a nice reading, but short. Enjoy! This is what The Dalai Lama has to say for All it takes is a few seconds to read and think over. 1 Networking for Novices Jenny Owen Head, Kings College Careers Service. 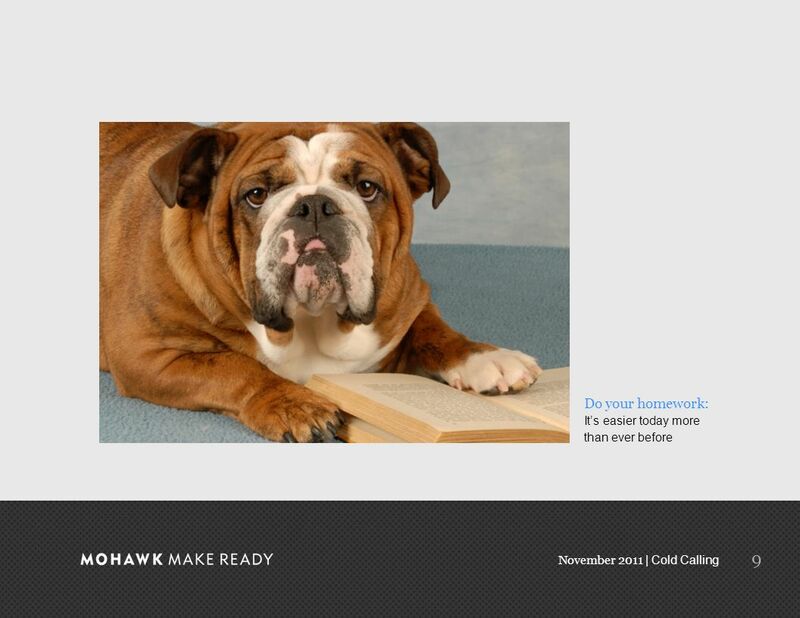 1 Preapproach and Telephone Techniques Learning Objectives: Recognize the importance of the preapproach in the sales cycle. Learn the objectives of the. Time Management Tips. 1. Estimate – Figure out realistic times for how long things take you and allow yourself enough time to complete them. If you find. For school, for work, for life!